Lindos is one of the national treasures of Greece; hotels are not allowed to be built in Lindos, and cars are not allowed in Lindos too, so the narrow streets remain vehicle free, (apart from a few special narrow delivery vans). 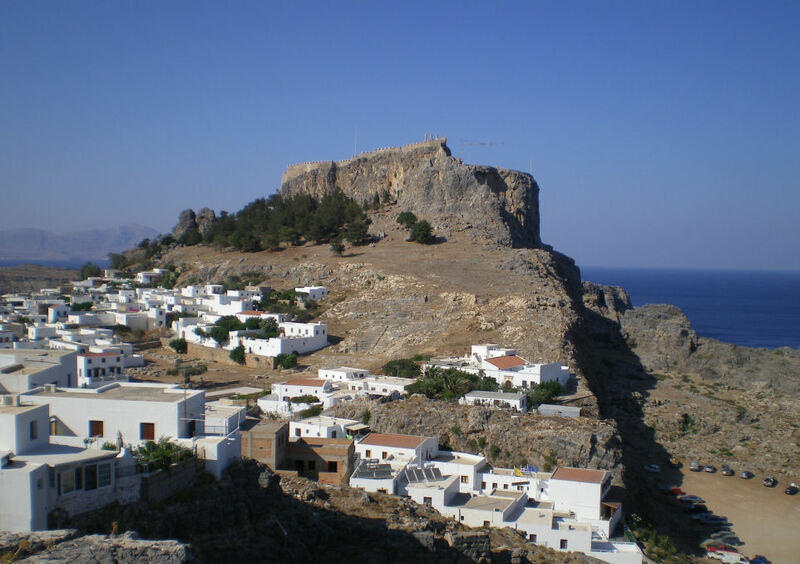 One of the main attractions of a visit to Lindos is the world famous Lindos Acropolis, set high up above the town. 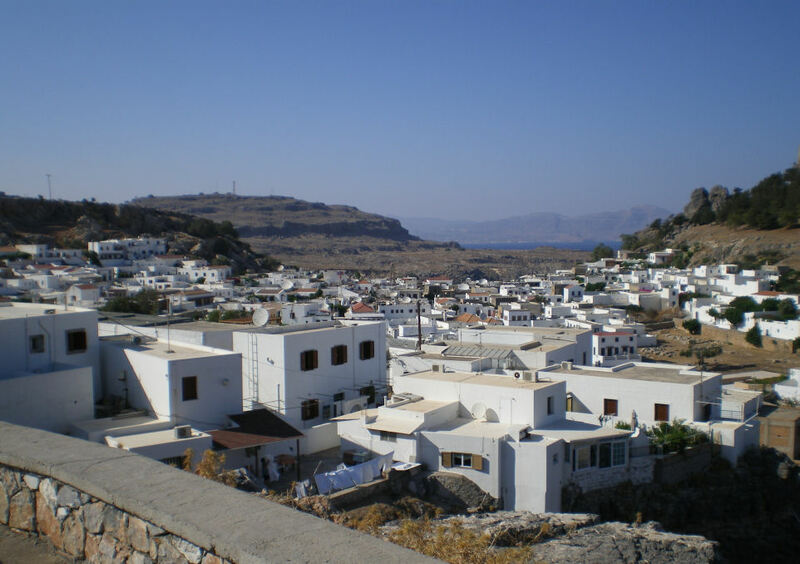 As you approach Lindos from a distance, it's an impressive sight, with lots of "sugar cube" houses gathered all around the steep rock with it's fortified acropolis on the top. Close up, Lindos is a maze of little alleys with shops, bars and restaurants mixed with medieval walls, simple architecture, with wonderful black and white "chochlaki" pebbled floors and painted ceilings. There are many grandiose "Captains Houses" in Lindos, which were built from the 16th to the 19th Century. You'll notice the historic influence of Roman, Turk, Italian and Byzantine rulers. Lindos is full of atmosphere and is a wonderful place to eat. Many of the Lindos restaurants are set up high in the rooftop gardens. These offer stunning views of the ancient greek architecture. Some of the restaurants and bars are set in Greek Captains Houses. If you're staying in Pefkos it's worth spending at least one evening visiting Lindos as the night time atmosphere is amazing. There are three beaches in Lindos. The main beach, which is known as Megali Paralia, Pallas beach, and St Paul Bay beach. Megali Paralia has sunbeds and water sports, and is the busiest beach. Further along the same bay is Pallas beach which is relatively quieter, although well served by beach side tavernas. St Pauls bay is to the south of the village, in a picture postcard location near the whitewashed St Paul's Chapel. You can rent a sunbed at St Pauls Bay, but you'll need to be early! There are a couple of Doctors to choose from in Lindos. Krito Medical Centre - Dr. Dimitris (Telephone 0944 644 888). Dr. C.P. Psaros can be found in the Doctor's Surgery on the route to Lindos Acropolis (Telephone the surgery 0244031452 or 0244031643 or mobile 0945 55 54 11). The surgery times can be found posted outside the respective clinics. There is a good chemist situated on the main street in Lindos. Many medicines can be bought over the counter, and the chemist speaks excellent English. There are a couple of banks near the Main Square in Lindos. Generally banks in Rhodes are open Monday to Friday 8am until 2pm. All Taxi's leave from the Main Square. As always, ask the driver how much it's going to cost before you leave. The fare's should be a set fee for each location. Accomodation in Lindos itself is unique in style, as you won't find a villa or hotel with a pool right in Lindos itself, as strict building restrictions won't allow this in the village. Some of the accommodation in the village itself is simply stunning. If it's a more modern hotel or a villa, with a pool etc you're looking for, then be prepared to stay just outside Lindos village bounary, but it's a lovely walk into Lindos each evening. Thomson have some great places to stay in Lindos. Their studios and apartments include Lindos Horizon Studios and Lindos Horizon Studios and Eleni Studios. From Thomson's A L Carte brochure there's the Lindos Blu, and from their Platinum range there's Lindos Mare Hotel. Olympic offer accommodation here including Gregory Apartments, Lindos Avra Apartments, Lindos Gardens, Lindos Sun Hotel, and Marianthi Studios.